One of the most interesting features of IO Interactive’s Hitman has been the game’s Elusive Target contracts, which are a form of “live content” as players can only assassinate these mission targets once, plus they will only be in the game for a limited period of time. It is clear, though, that these Elusive Targets have been a colourful bunch, as we’ve had the likes of an African dictator, an eccentric music star and a corrupt pharmacist, amongst others. 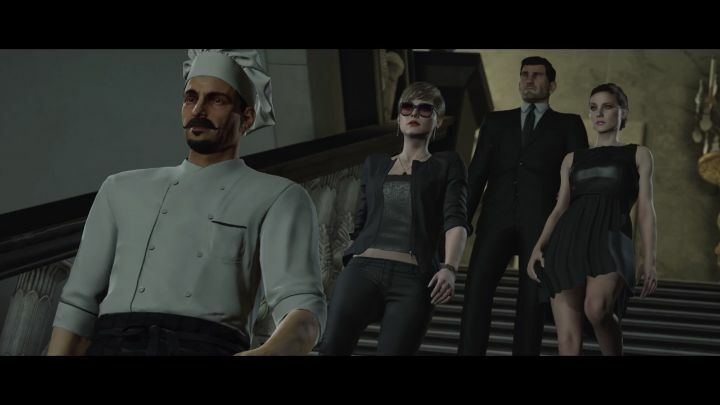 And now the latest Elusive Target has arrived in the game’s Paris level, who is none other than a celebrity chef who’s infamous amongst his employees for resorting to violence, according to the briefing video below. Of course, taking down “The Chef” won’t be an easy thing to do as he will be escorted by an entourage of social media people all the time (that’s narcissism for you). He will also be moving around a lot within the luxurious Paris buildings in which Hitman’s Sanguine Fashion Show (the game’s first mission) takes place. At least those who take the pains to eliminate this narcissist prone to assaulting his employees will be rewarded with fancy virtual clothing for the game’s protagonist Agent 47, though. 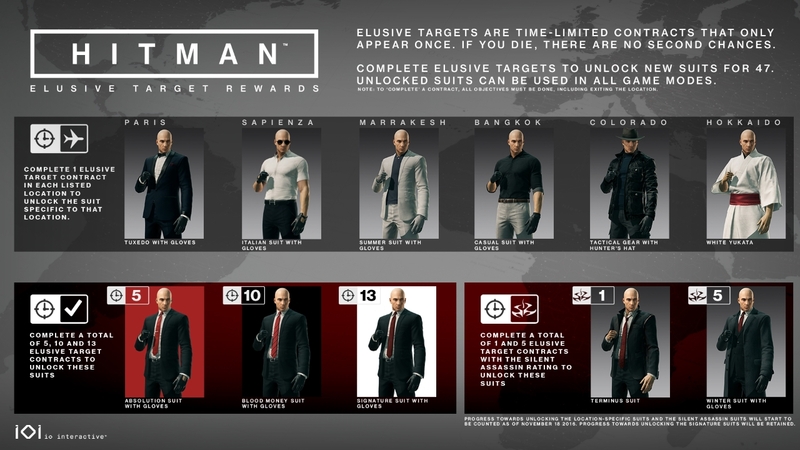 But the game’s developers have revealed that the reward scheme is now different from the earlier one, with the various items of clothing and number of Elusive Target missions that players must complete in order to unlock the different suits being shown in the image below. And it is likely that quite a few players will be motivated to complete as many Elusive Target missions as possible, given that these missions have been such a fun experience to date, and the fact that players only have one chance to assassinate the target and escape before getting caught only adds to the excitement. So hopefully IO Interactive will keep releasing these Hitman missions in the future, something that looks likely taking into account that further seasons of the game are now in the works, after the current season ended with Hitman’s Hokkaido episode last October. Note: Hitman’s Elusive Target mission 14, “The Chef” will be available to play until November 25.